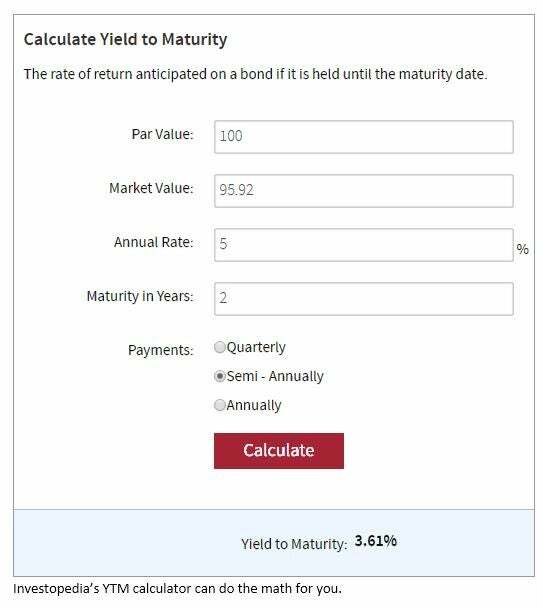 You can use the bond yield formula to determine the return you’ll realize by holding a bond to maturity. The required yield, conversely, is the return a bond must offer to make it worthwhile to investors, and it’s usually the same yield offered by other plain vanilla bonds in the market with similar credit quality and maturity. Once you’ve decided on the required yield, you can figure out the yield. The adjusted current yield of 6.84% is higher than the current yield of 5.21%. That’s because the bond’s discount price ($95.92 instead of $100) gives you more of a gain on the investment. Keep in mind: If you buy a bond between coupon payments, you should use the dirty price in place of the market price in the equation. Zero-coupon bonds have only one coupon payment, so we have to use a different calculation. The current yield calculation show us the return the annual coupon payment gives us, but it doesn’t take into account the time value of money. For this reason, when investors and analysts discuss yield, they’re usually referring to the yield to maturity (YTM), which is the total anticipated return if a bond is held until maturity – including any capital gains or losses due to price fluctuation. Because calculating YTM is complicated and time consuming, investors (both private and professional) typically rely on financial calculators to do the math. A good one to try is Investopedia’s Yield to Maturity Calculator. To calculate YTM, enter the par value, market value, annual rate (%) and maturity in years, and choose the frequency of payments. An example of Investopedia’s calculator is shown below. As a bond’s price increases, its YTM falls. For example, if you buy a bond with a par value of $100 and a 10% coupon, its yield would be the coupon rate divided by the par value (10 ÷ 100 = .10) or 10%. If the bond price dropped to $90, the yield would become (10 ÷ 90 = .11) or 11%. You’d still earn the same amount of interest because the coupon is based on the par value. With premium bonds, the coupon rate is greater than market interest rates. With discount bonds, the coupon rate is less than market interest rates. YTM is the yield you’ll receive if you reinvest all coupons received at a constant interest rate. Here’s an example, assuming a bond with a par value of $100, a current yield of 5.21% and a price of $95.92. The bond matures in 30 months, and its coupon is 5%, paid semi-annually. Remember, the cash flow is the amount you receive for each coupon payment. Since the coupon rate is 5% and it’s paid twice a year, the cash flow would be $2.50. Since we know our bond price is $95.92, we can now see the interest rate must be 6.8%. Callable and puttable bonds have additional yield calculations: a callable bond has to account for the issuer’s ability to call the bond on the call date; likewise, a puttable bond has to account for the buyer’s ability to sell the bond at the put date. Note that maturity value has been replaced by call value, and now “n” represents the time until the call date. To find YTP, you’d change call value to put value, and “n” would represent the time until the put date. Learn about how investors should evaluate bond performance. See how the maturity of a bond can impact its exposure to interest rate risk.